The Bluetooth Keyboard case is the perfect companion for your iPad. 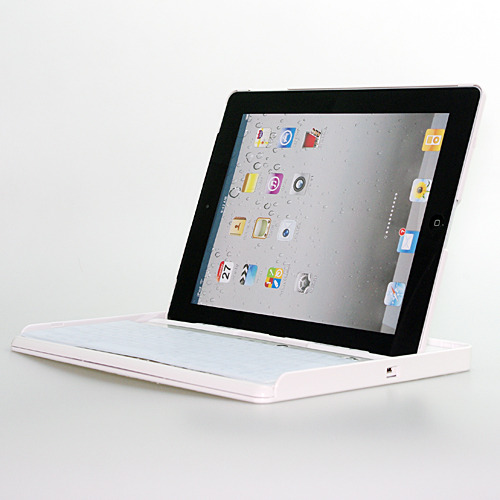 Its exclusive features and sleek design give your iPad durable protection, added functionality and style. It doesn't only protect your iPad when on the road but also provides a handy wireless Bluetooth keyboard and hands free stand when you reach your destination. The keyboard is a Bluetooth wireless keyboard. One nice thing about that is the protection you will get form spills. It also allows for very quiet typing so if you are concerned about noise then you might want to consider this case. Something else that is really nice is that the keyboard has a built-in rechargeable battery. It can last up to 45 hours per charge and it can also be charged using a USB connection. On the case, there is a magnetic clasp that keeps it closed and this extends the entire height of the case which helps to secure the iPad2 in place. It holds the case closed so it's secure and easy to carry, and there's less concern about something getting in between the iPad and the keyboard while the case is being transported in a larger bag. The magnet is just right -- easy to open when you want it open, but nice and secure when you want the case to remain closed.